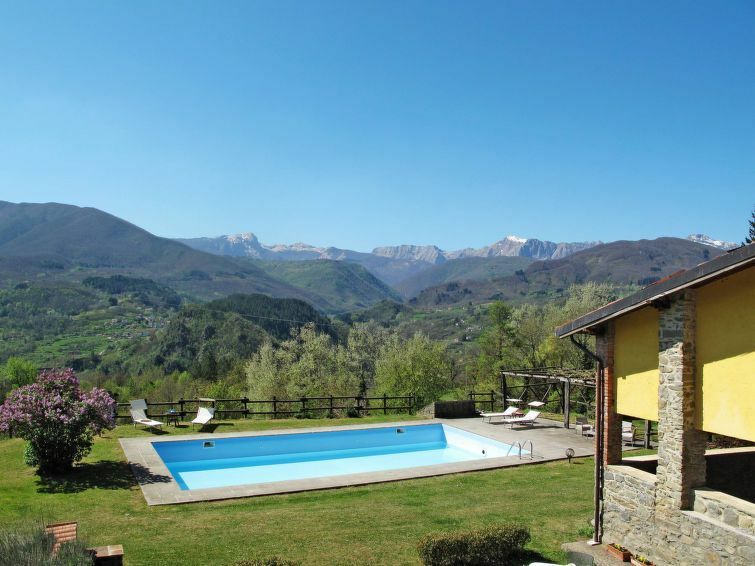 Situation: in the hamlet Sillicagnano, suburbian area, altitude 550 m, panoramic view, view of Apuan Alps. Access/parking: gravel road, approx. 200 m, steep. parking on the estate. Estate (shared use with holiday guests): approx. 6 ha, open plot, in a hillside, meadow, forest. Outdoor facilities(shared use): reserved open space (pergola), reserved open space (pergola), reserved open space (pergola), furnishing provided. Pool (shared use): 12.0 x 6.0 m, 1.50 m deep, 18.05.19-05.10.19. Pool area: tiled, lawn for sunbathing, sun loungers, external shower. Plot description: private part of the estate approx. 50 m². terrace 30 m² (roofed), furnishing provided, brick barbecue. Center Sillicagnana in approx. 800 m. Castelnuovo di Garfagnana in approx. 11 km. Lucca in approx. 56 km. Next shopping possibility in approx. 800 m. Next supermarket (Castelnuovo di Garfagnana) in approx. 11 km. Train station Villetta / Villetta S. Romano in approx. 4.2 km. Airport Pisa in approx. 91 km. Golf course Golf Club Garfagnana / Pieve Fosciana (18-hole golf course) in approx. 5 km. apartment, 2 - 4 people, 1 room/s, 1 bathroom/s, approx. 38 m², 1 floor/s, apartment on ground floor, pool-side, restored 2017, separate access to the property. Please note: Non-smoking house. Feature: Property in a holiday complex (2 building(s) in total, 3 units in total). agriturismo. Furnishing: holiday standard, rustic, friendly, cotto floor. Equipment: satellite TV; internet access Wi-Fi (included); no heating option. Living room/bed room: double sofa bed, queen-size bed (1.60 m wide) in the sleeping niche, exit to terrace. Kitchenette: in the living room. Kitchen/ cooking equipment: 4 gas rings, oven, combination fridge-freezer, coffee machine. Local service charges Holiday resort tax. Linen/towels available. Change of bed linen/towels, € 8 per person. Deposit € 200 (in cash). Cot/​High chair free of charge (on order). Pet not allowed.